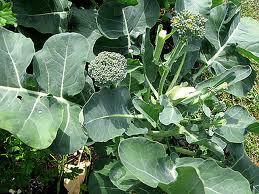 I have been growing broccoli in my backyard garden. The broccoli didn't develop into large heads. Instead it looked like broccolini. Very little was edible. This weekend I pulled out the remaining plants to start a new planting and I brought the pitiful little stalk into the house to cook with dinner. I CAREFULLY washed the stalk, running it under water vigorously. While holding the stalk I started cutting it into bite size pieces. Some of the water droplets dripped on to my hand. Oh wait, that isn't a drop of water - it was a big orange spider! OMG! I have never shook my hand so quickly! 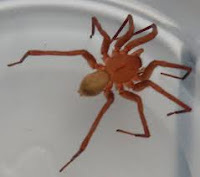 Spider off? Check. Now I had to find it and get it out of the house. Normally I treat spiders with respect. I am a life-long fan of E.B. White's Charlotte's Web. When there is a spider in the house I gently catch it and take it outside. This one was going to die. It violated the agreement of co-existence by being on my body without my permission. I caught the eight legged assailant and disposed of it. Then I re-washed the broccoli and inspected it, I thought carefully. I put the broccoli bits and water into a bowl and zapped it in the microwave for 2 minutes. Taking it out and putting it on a plate I stopped and peered closer . . . OMG, that is an egg sack on the broccoli and it has been microwaved and has opened to reveal a mass of spider eggs. The blob appearing similar to a hack of spit. The broccoli was immediately put in the garbage and we had one less vegetable for dinner. Now I cannot bring myself to eat broccoli. I blame the broccoli for having the spider, not the spider for living there. Damn broccoli. It has been three days and I am avoiding broccoli like the plague. Looks like I will be keeping the pounds off with string beans and tomatoes again tonight. Last summer, there were a few people who bought some grapes at a couple local stores that had black widows in them. I think there was 3 different times this happened. I stopped reading the articles in the paper. I still can't buy a bunch of grapes. I once had a black window in my basil plant on my kitchen window sill. I got over that - after a few years. Now I grow basil and always check for the black window spiders. Luckily they are not as deadly as they are painful. jane, please don't turn on Broccoli. You know how much I love it! LOL. I actually like frozen more than I like fresh - so that works. Thank you for the suggestion. You need to write a sequel "Trust God to Keep the Spiders out of the Broccoli! Lauren, your aversion to spiders is duly noted. EKK! I have never had slugs in my lettuce but I have to admit that sounds worse that spiders. I just posted a blog post... I now have no use for broccoli in my life. I had the same thing happen today.. what are the chances??? I had to post a picture, because I thought there was no way anyone would believe me! I am buying brussels sprouts for now on.